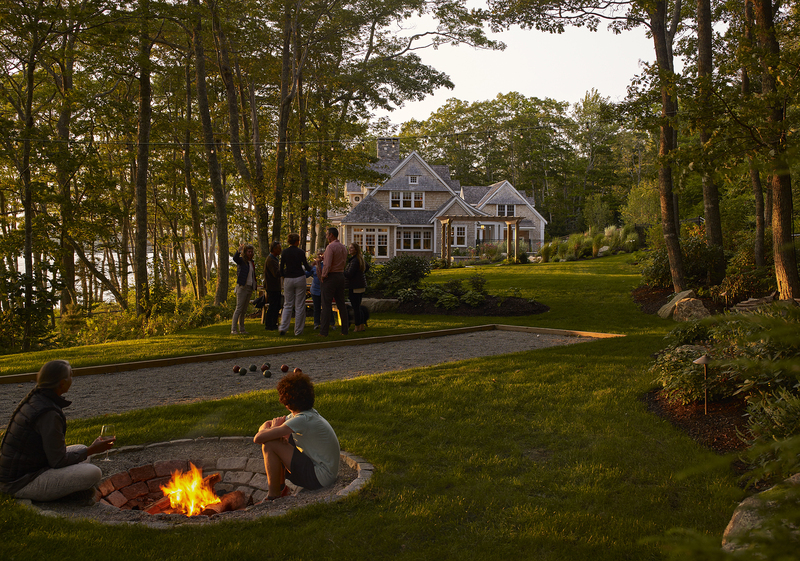 Nestled along the coastline of Linekin Bay, this site held an unfinished build—a skeletal structure with vast opportunity. 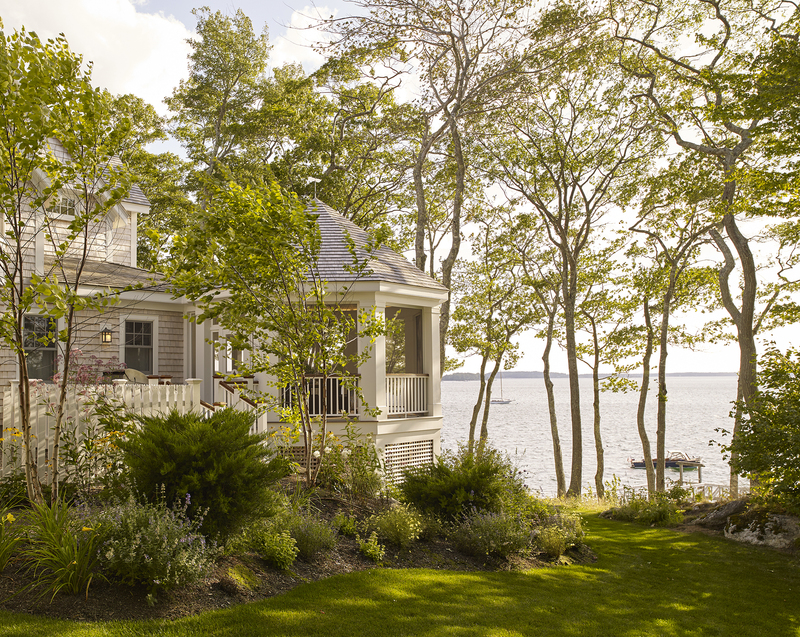 When former clients approached Knickerbocker Group in search of a mainland home, we made the connection and our clients quickly affirmed the potential. 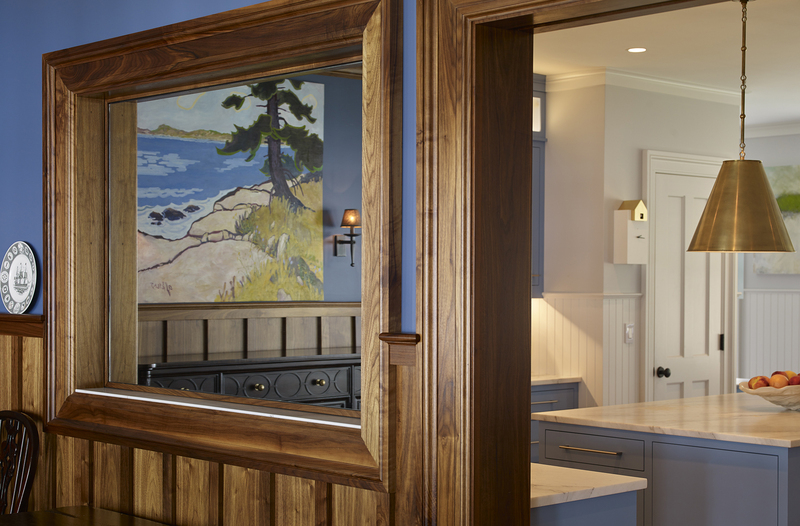 Envisioning major reconfigurations to meet the client’s needs, the home was transformed into a more thoughtful layout with room for the homeowner’s extensive family while accommodating their love of hosting. 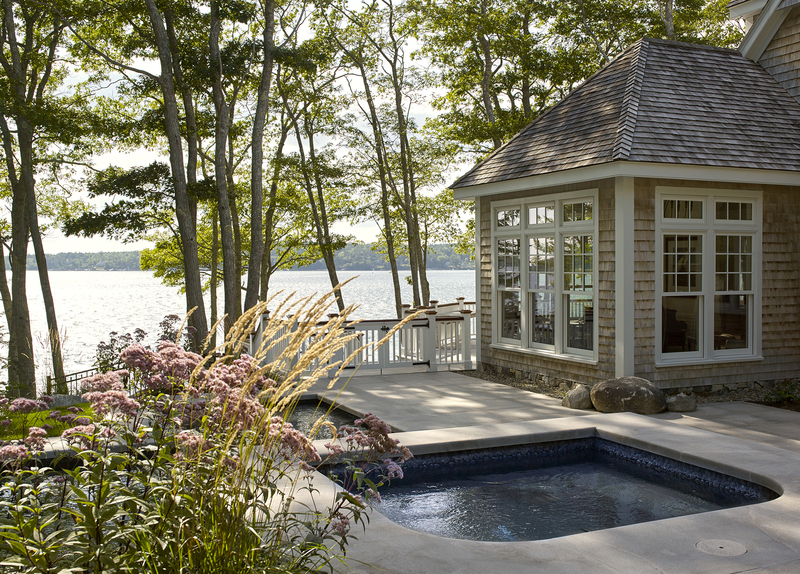 Knickerbocker Group worked with landscape architect Arek Galle and landscape contractor Back Meadow Farm to gracefully unify the architecture with the landscape, hot tub and pool, melding styles with the coastal landscape, and extending the warmth of the family home outside to its Maine surroundings. 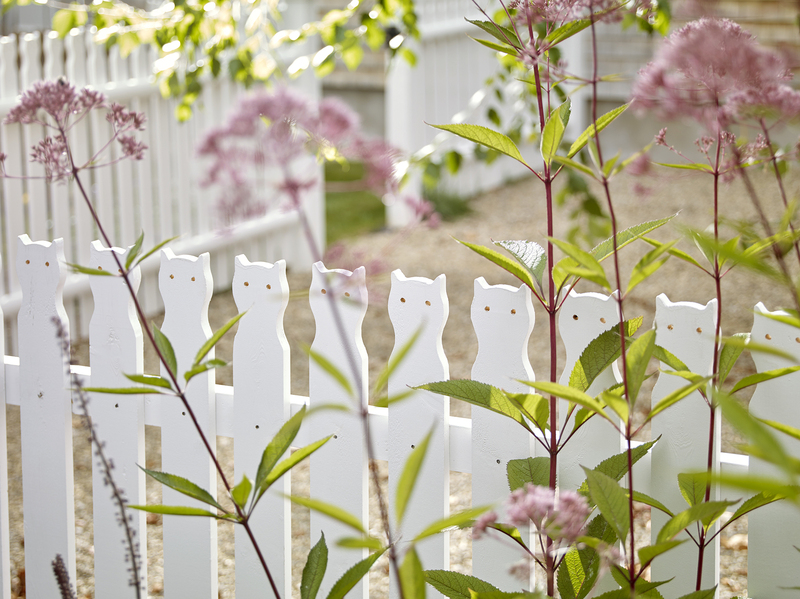 As our client adored the cat fence at the local Coastal Maine Botanical Gardens, Knickerbocker Group recreated the charm of the design. 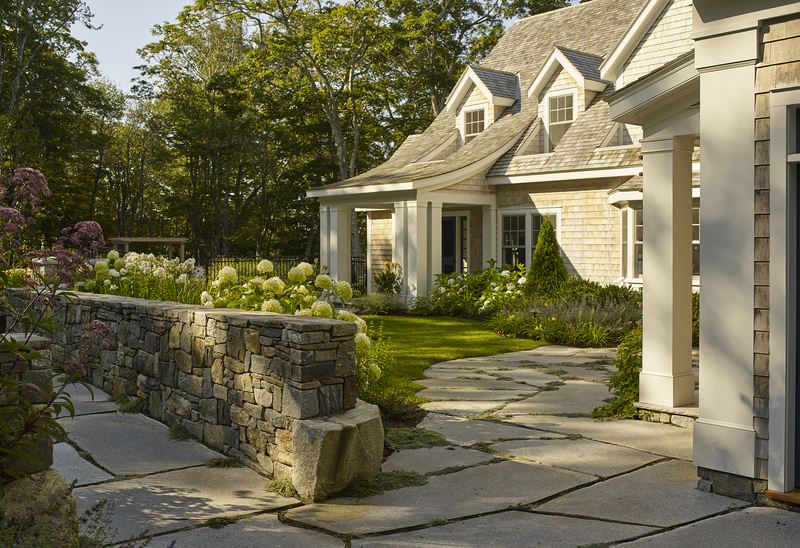 Playfully lined with colorful flowering shrubs and perennials, the fence abuts the cat and dog doors which lead to the side yard. 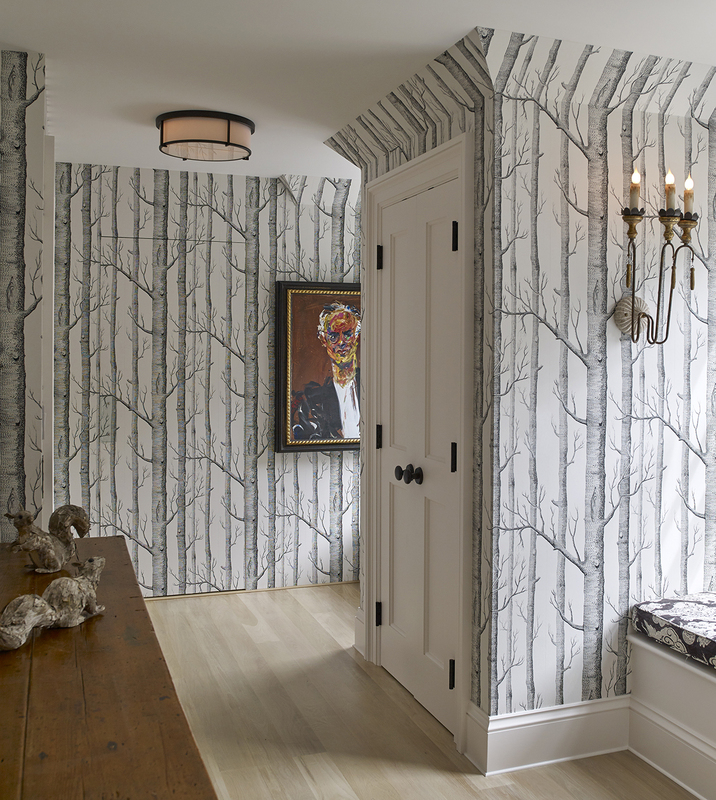 With an interior design background and an extensive art collection, our client was an integral part of the home’s design detailing. 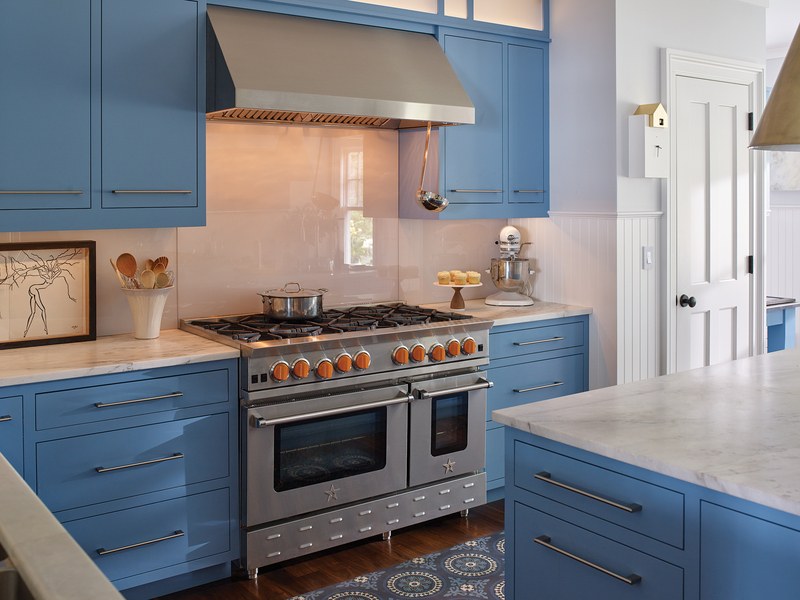 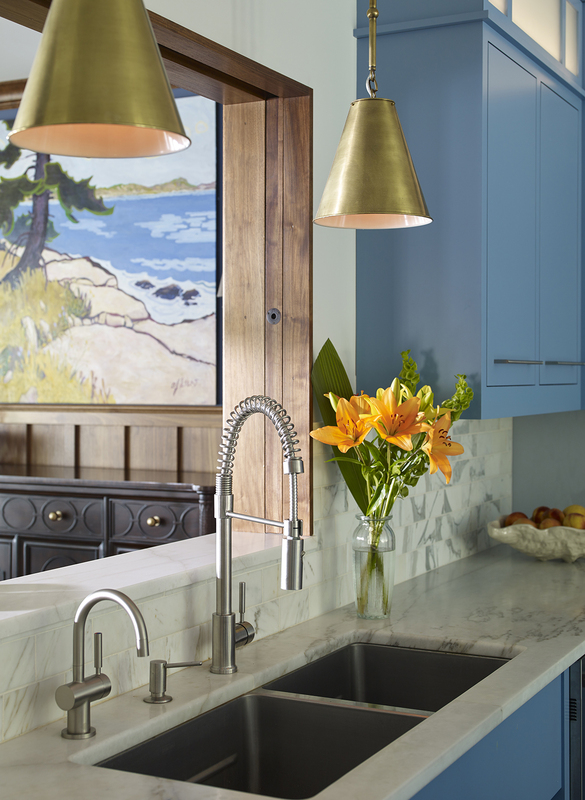 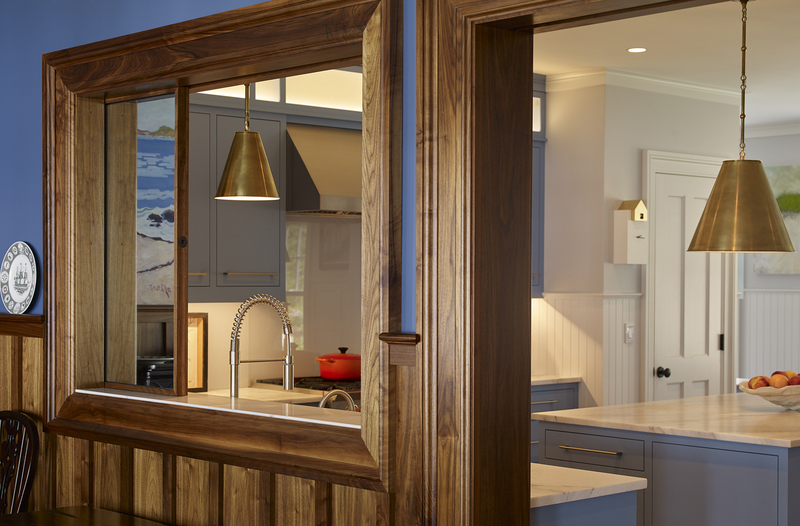 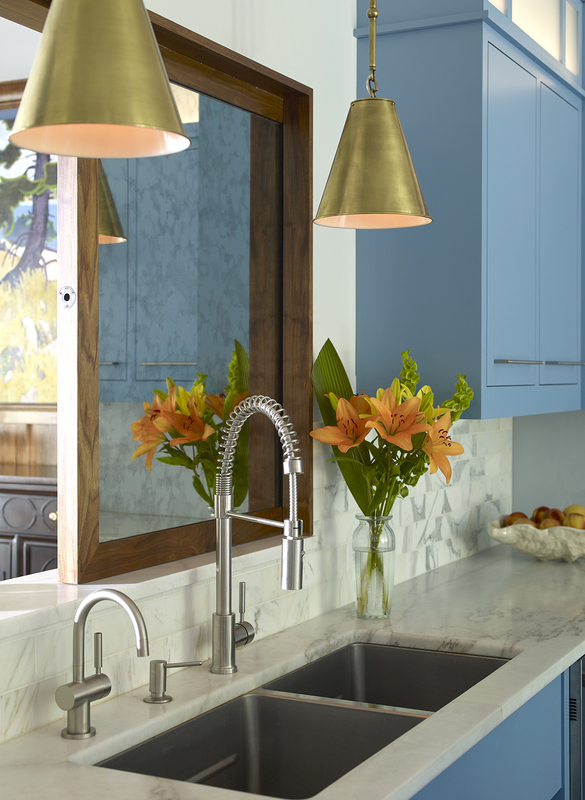 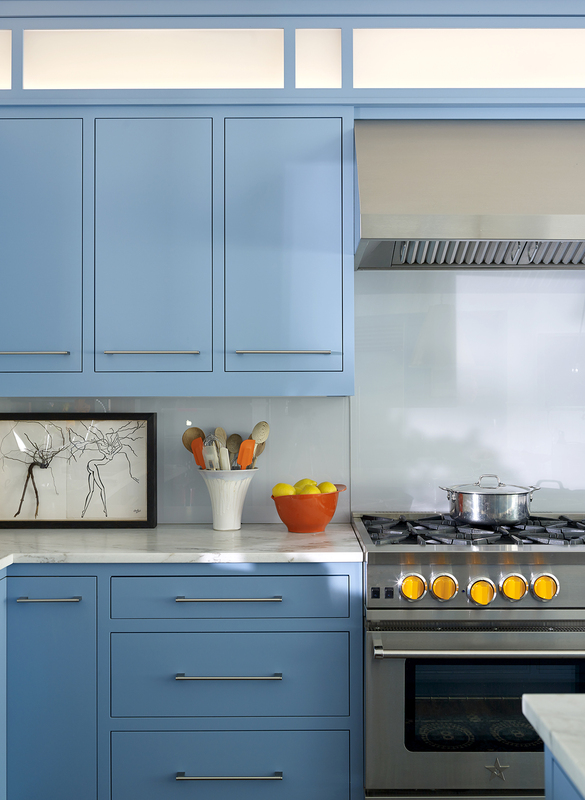 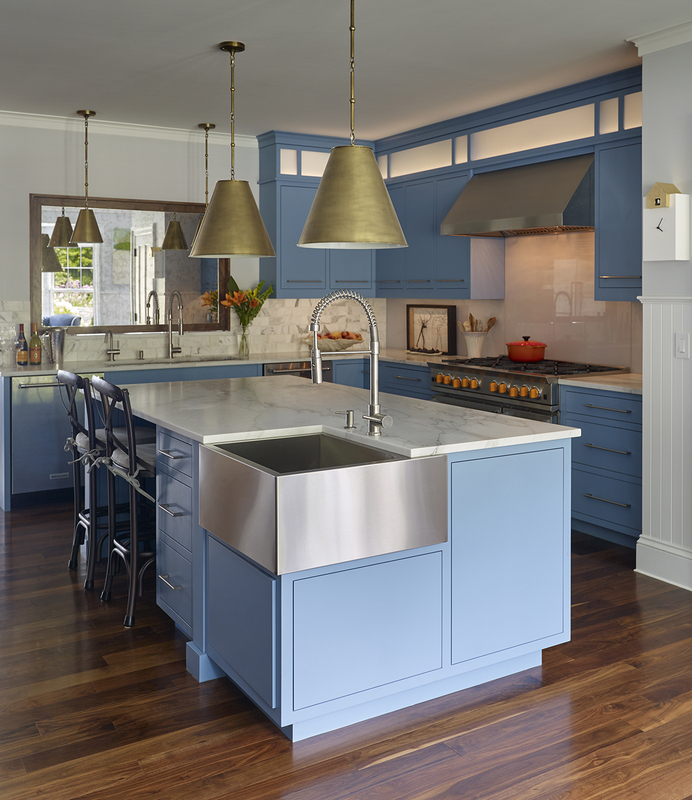 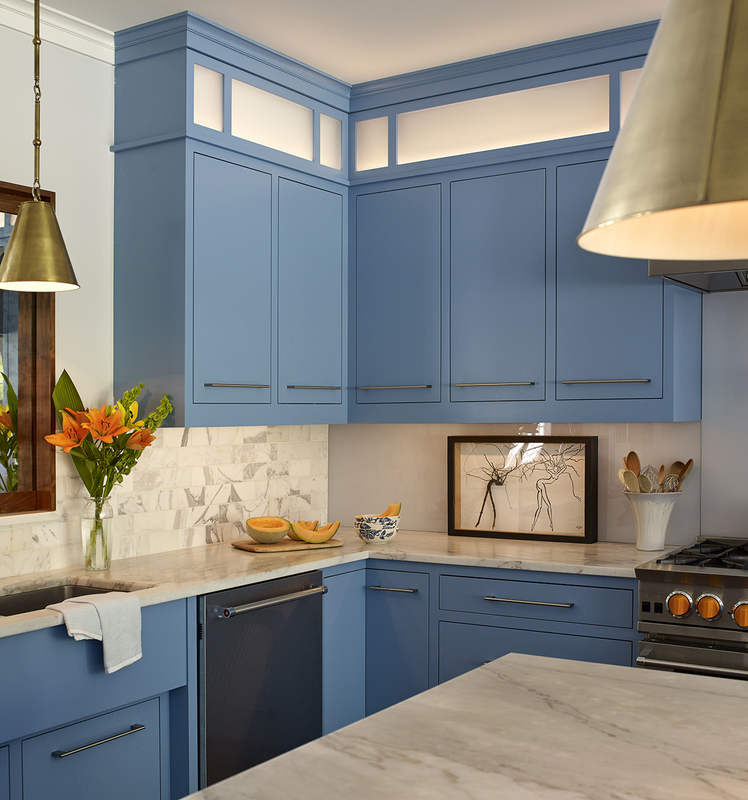 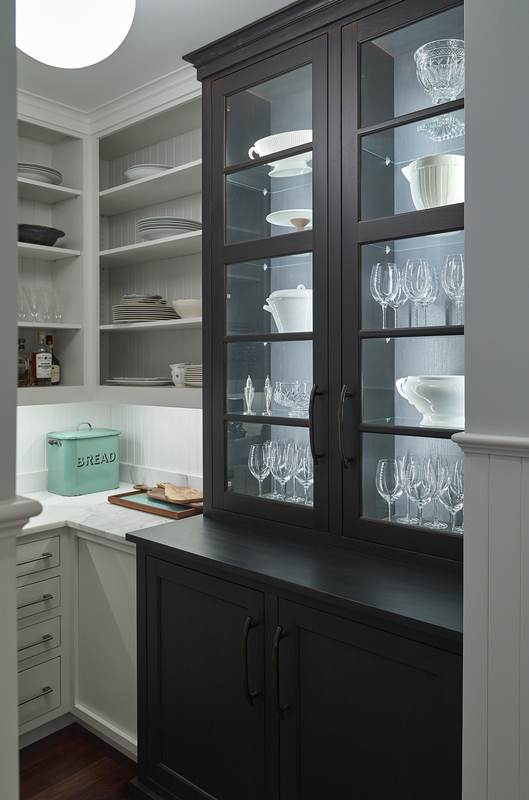 From envisioning the kitchen, to in-depth aesthetic and functionality throughout the home, the project was a true collaboration between the owner and Knickerbocker Group’s design and construction team. 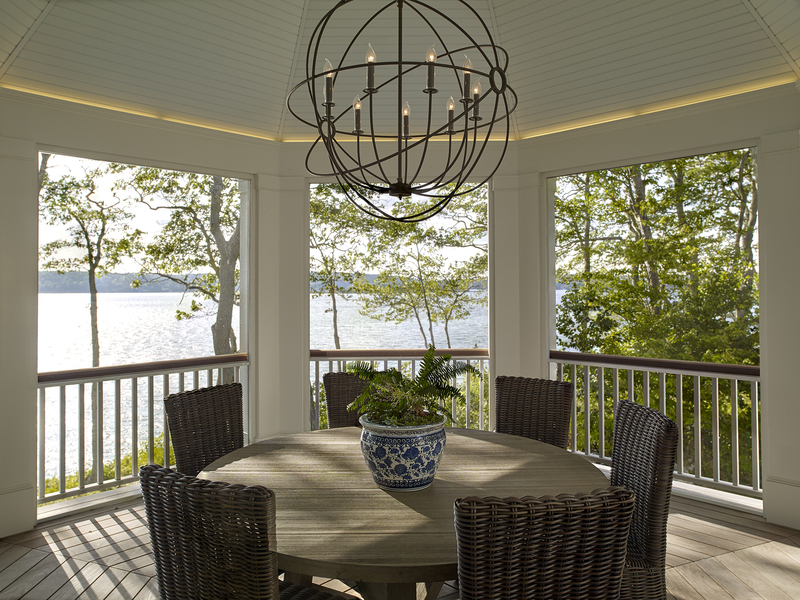 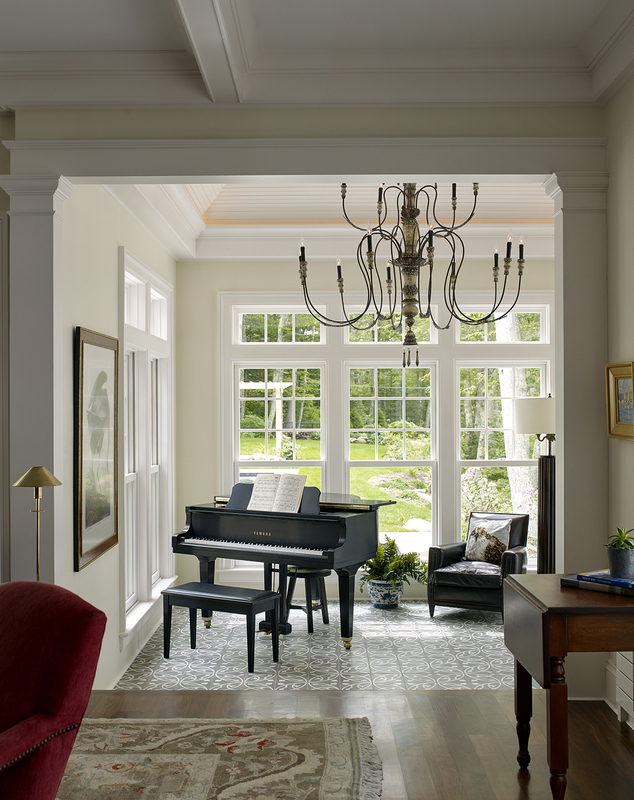 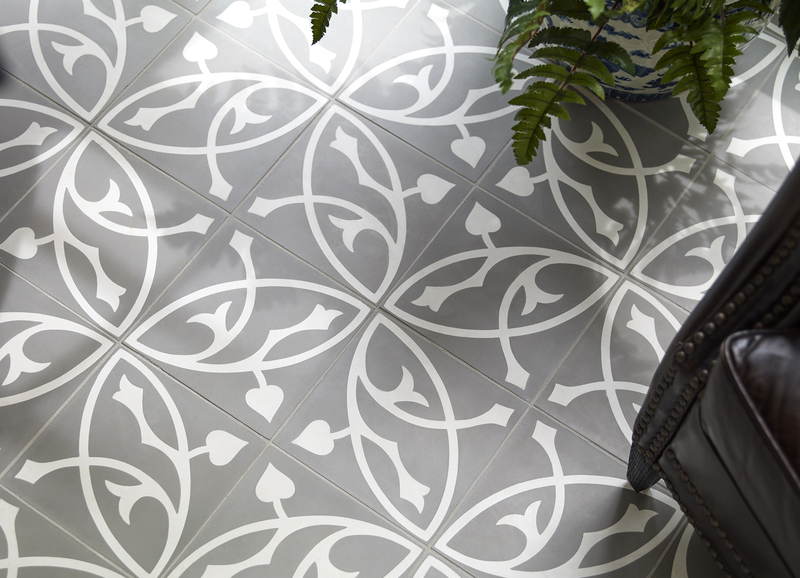 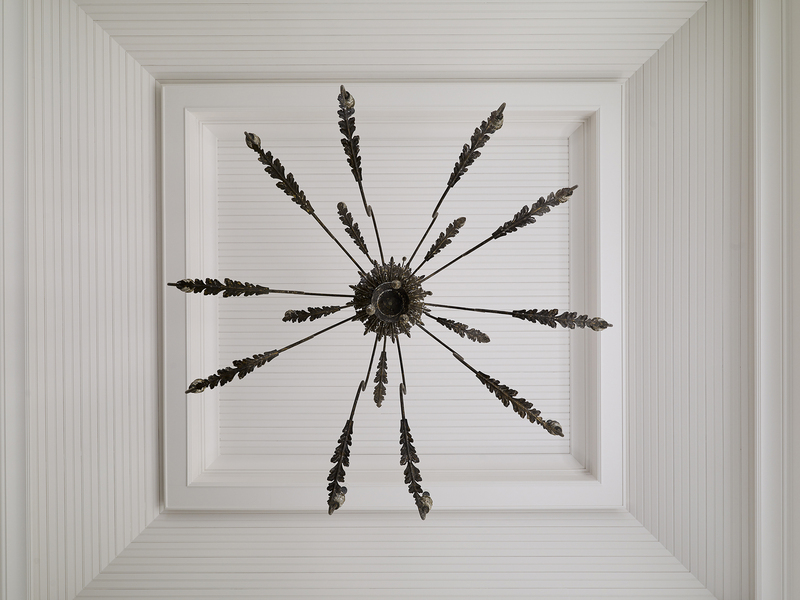 Completing the charm and impact of the space, the sunroom features a traditional cement tile floor, paired with a grand and elegant chandelier fixture. 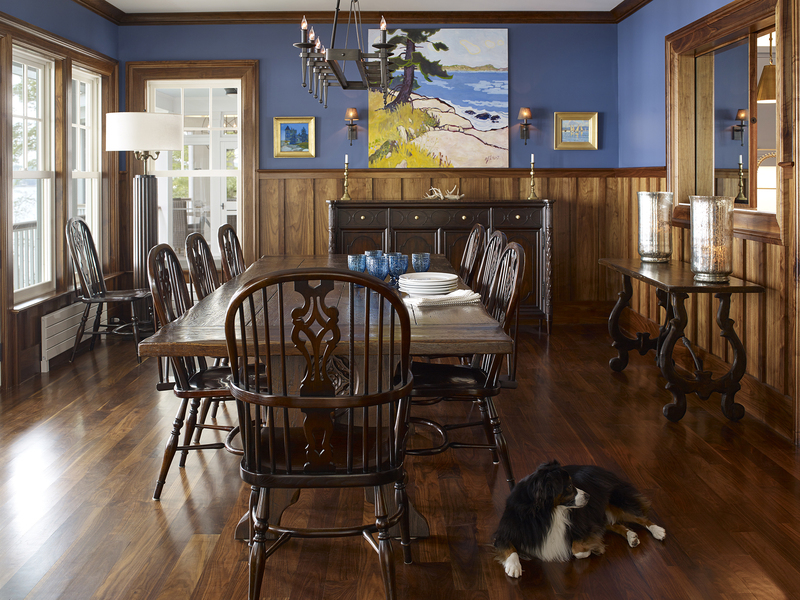 Walnut flooring and blue tones are a common thread throughout. 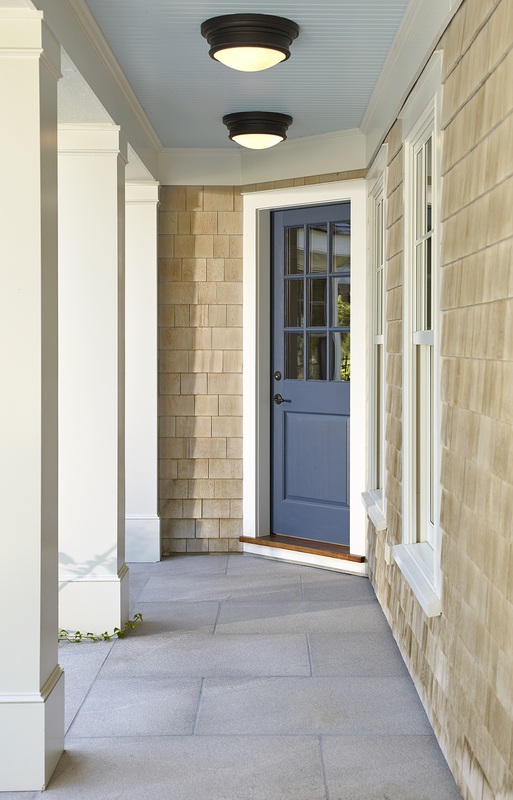 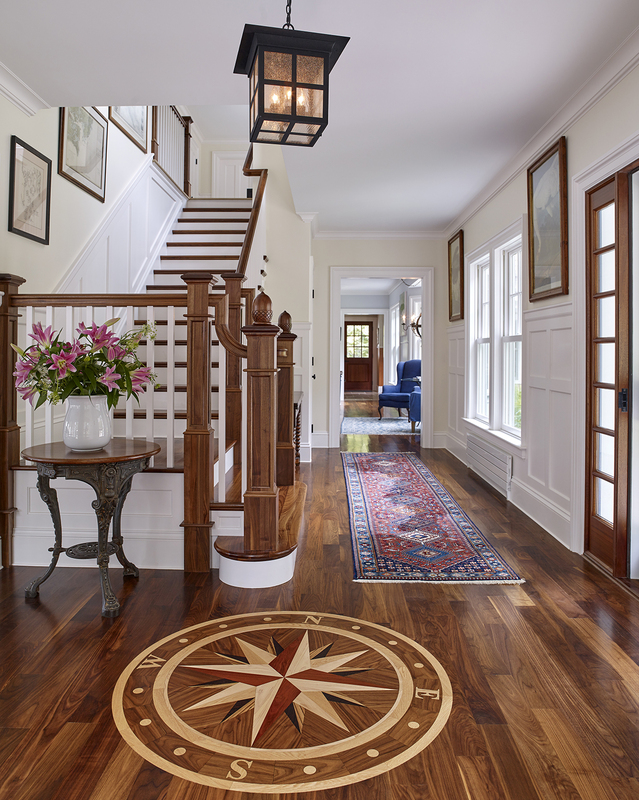 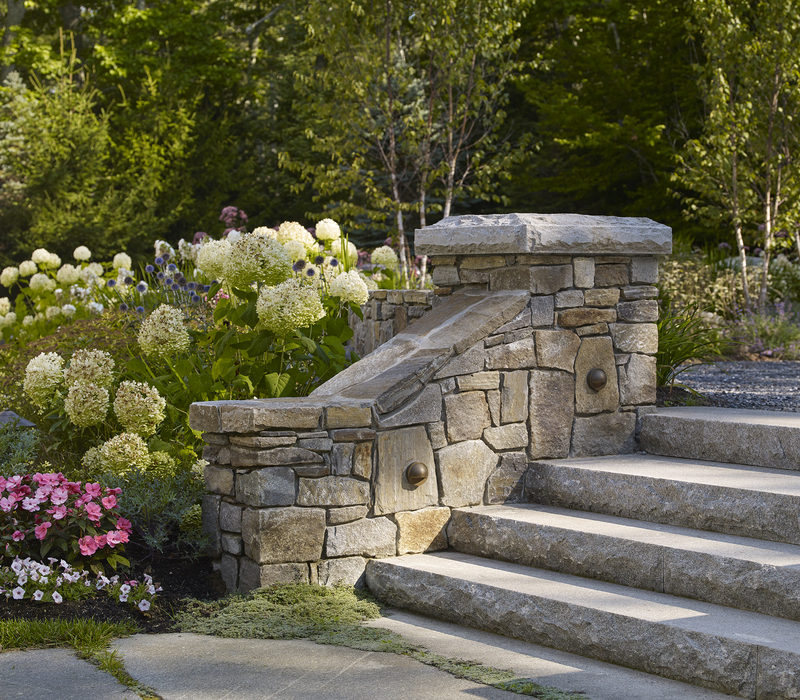 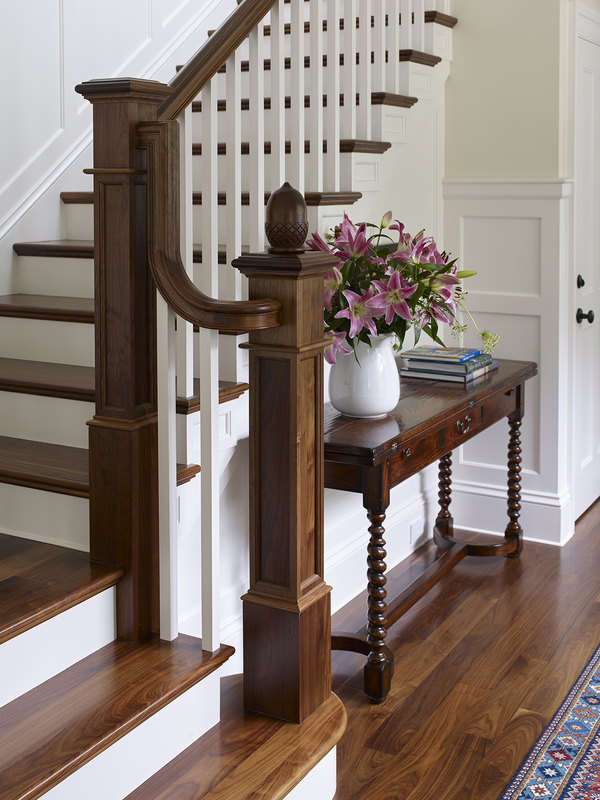 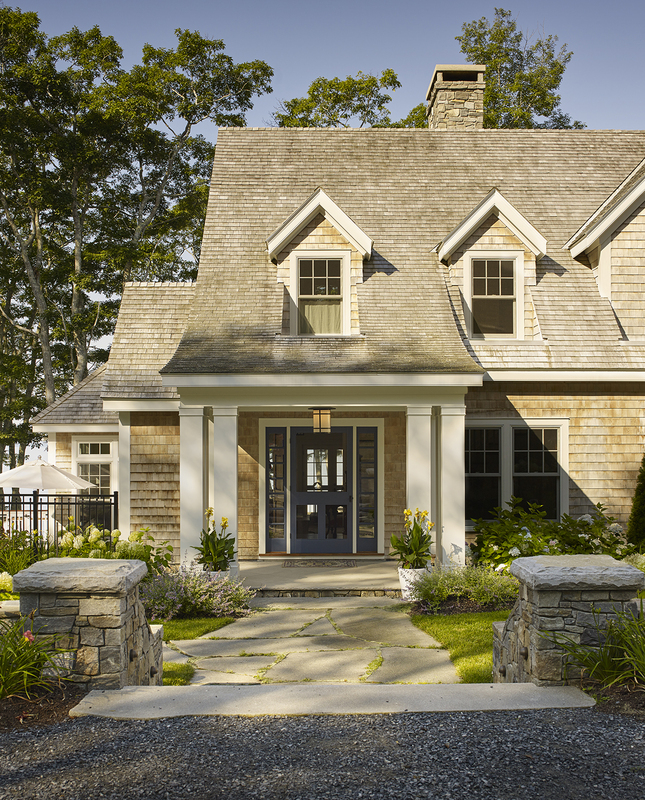 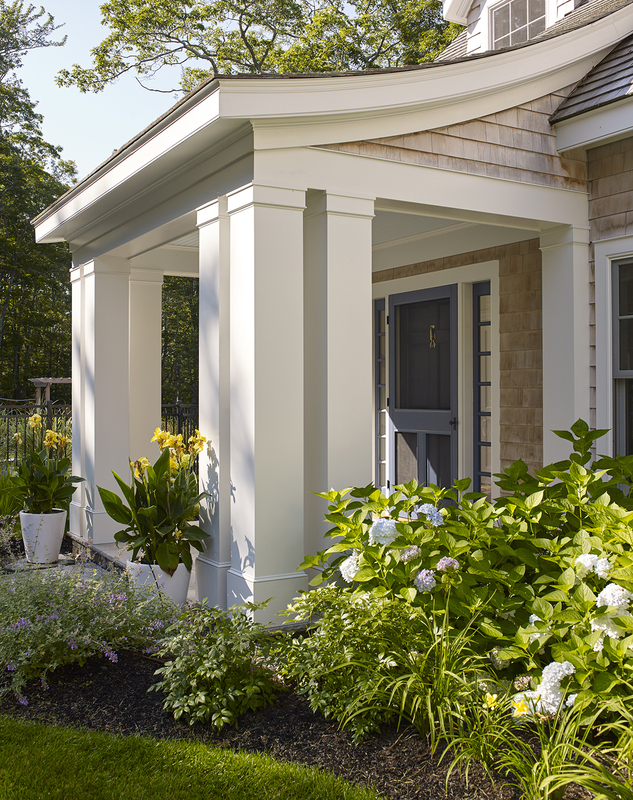 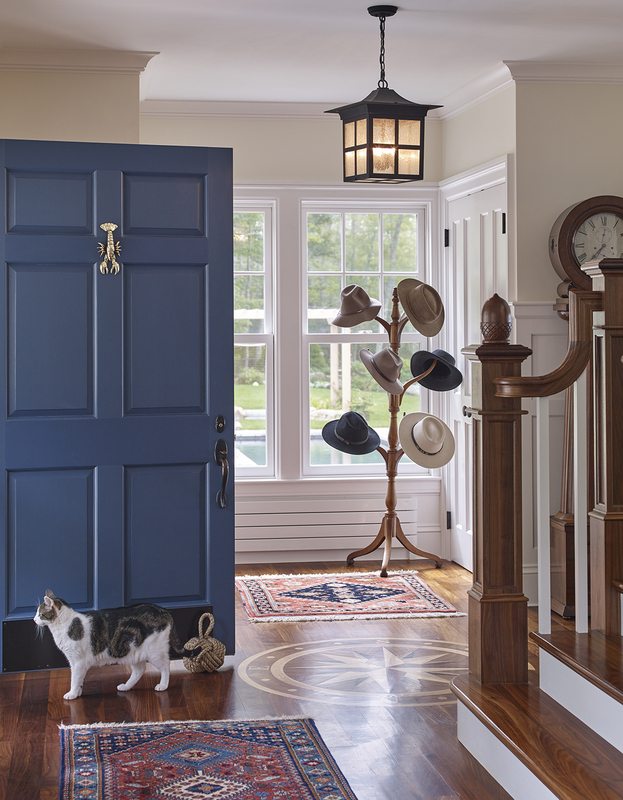 Accenting the main entry is an inlay compass, a custom acorn newel post and a sweeping floor plan—each detail creates a lasting welcome upon entering the home. 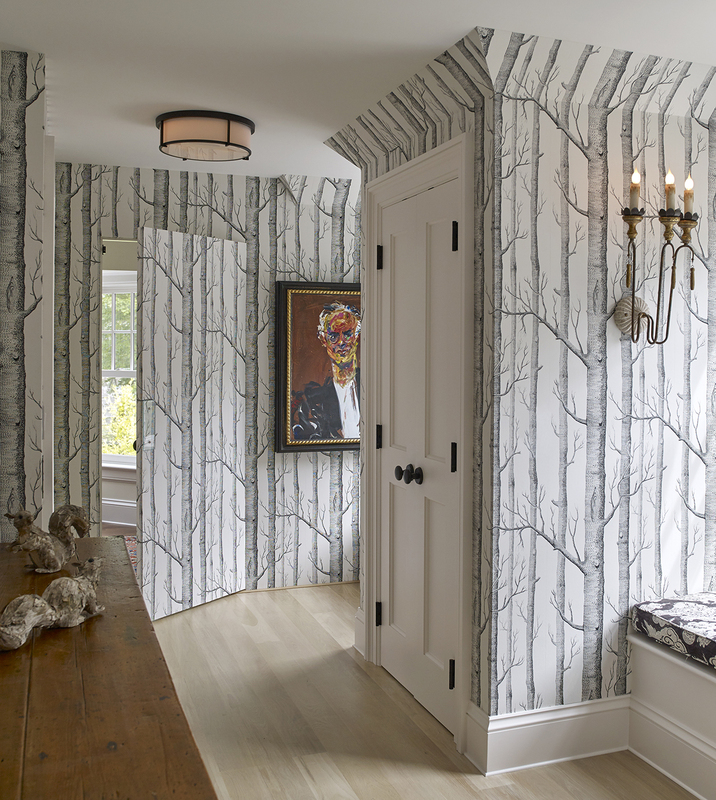 Wallpaper installed by Susan Connery ingeniously masks the hidden door to a tucked away office. 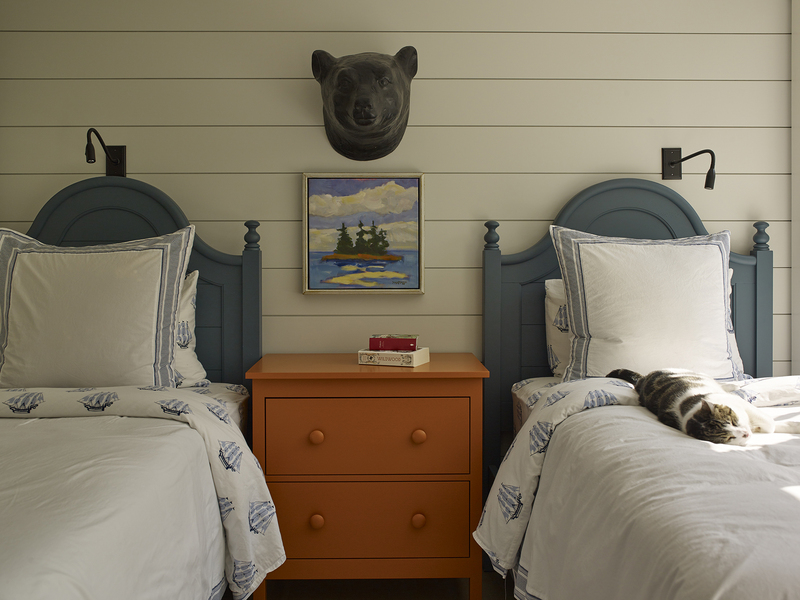 “The Bear Room”, a comfortable guest-space, is enjoyed by the homeowners many grandchildren, children and various visitors throughout the year. 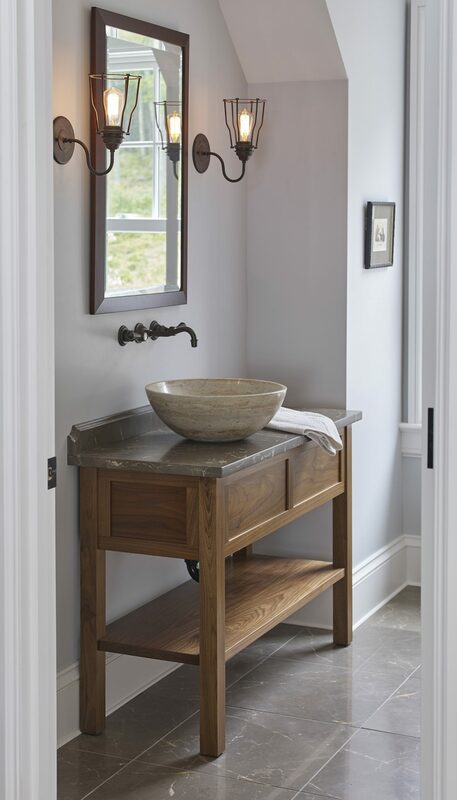 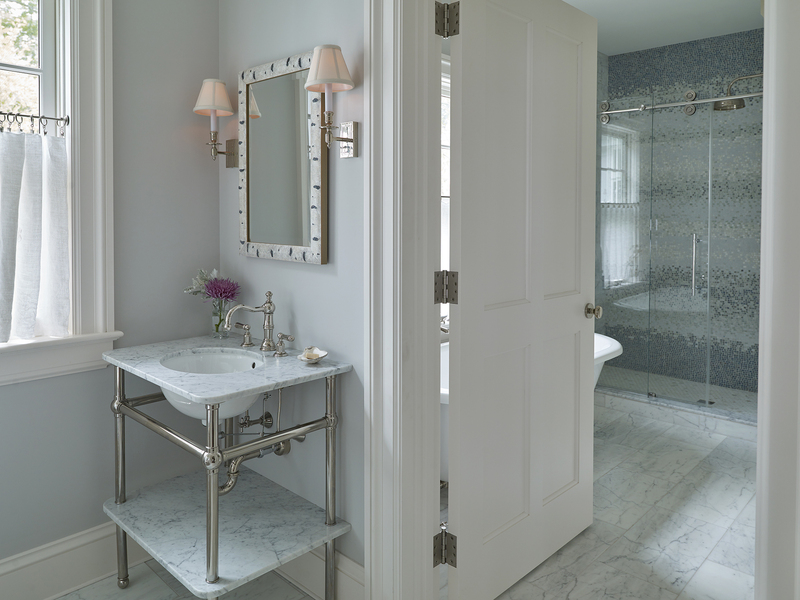 A custom sink, countertop and tile adorn the quaint powder room. 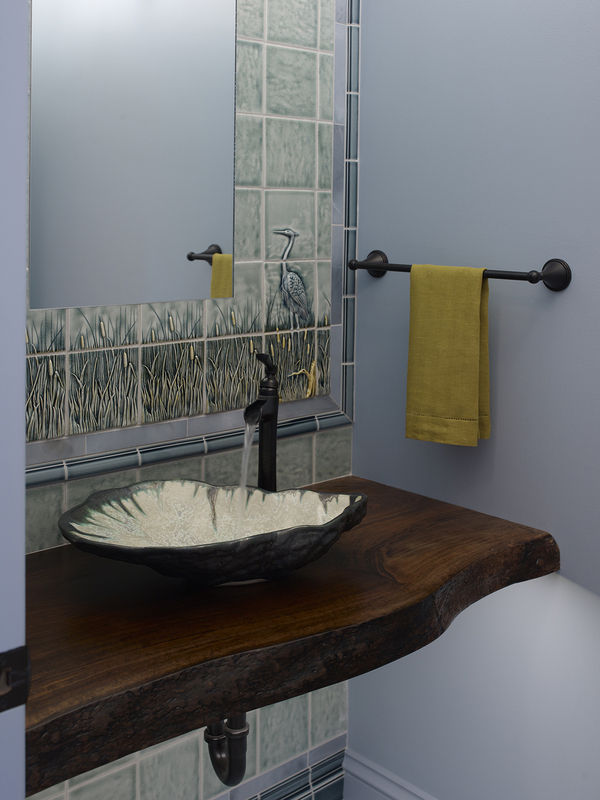 The sink basin features the work of artist and potter, Alison Evans. 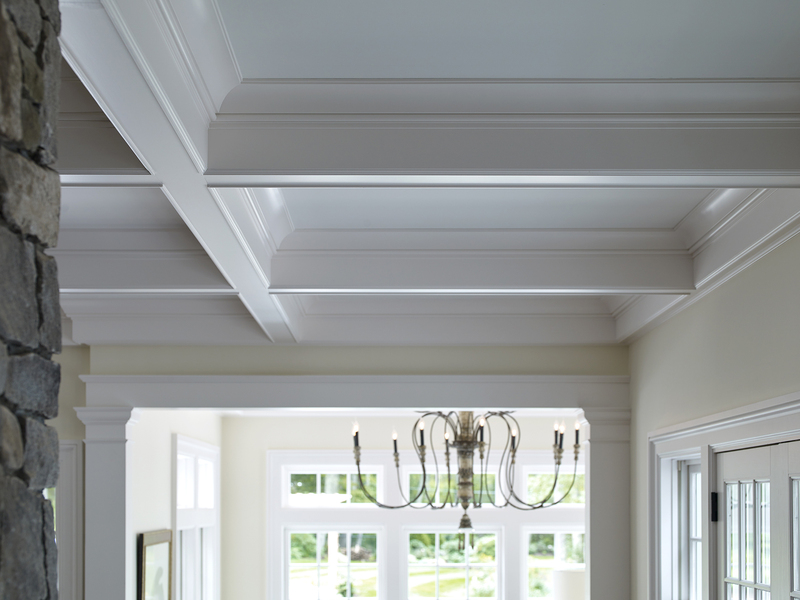 There were challenges that came with a pre-existing structure including in-depth reconfiguration of the layout and systems. 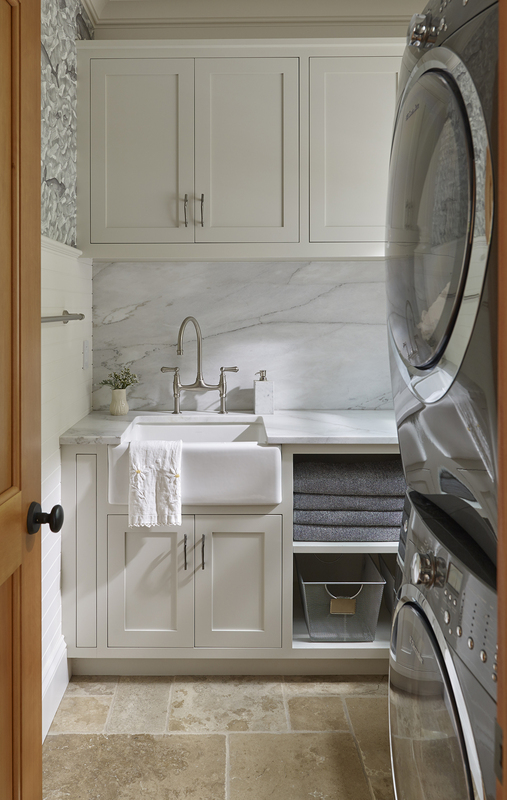 Accommodating additional bedrooms, bathrooms, an elevator, as well as a guest space above the garage required intense logistical planning. 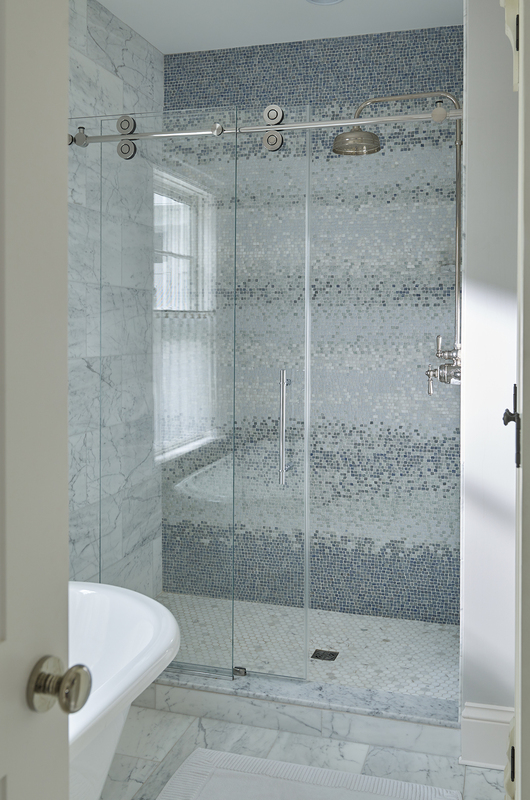 Everything was wired and plumbed for the original build, requiring thoughtful upgrades to meet changes in the new design.